Today was supposed to be 71° and partly cloudy, but the sun never came out, and the temperature didn’t climb past 60°. We were clipping right along though when there was an accident on the Piler next to ours. 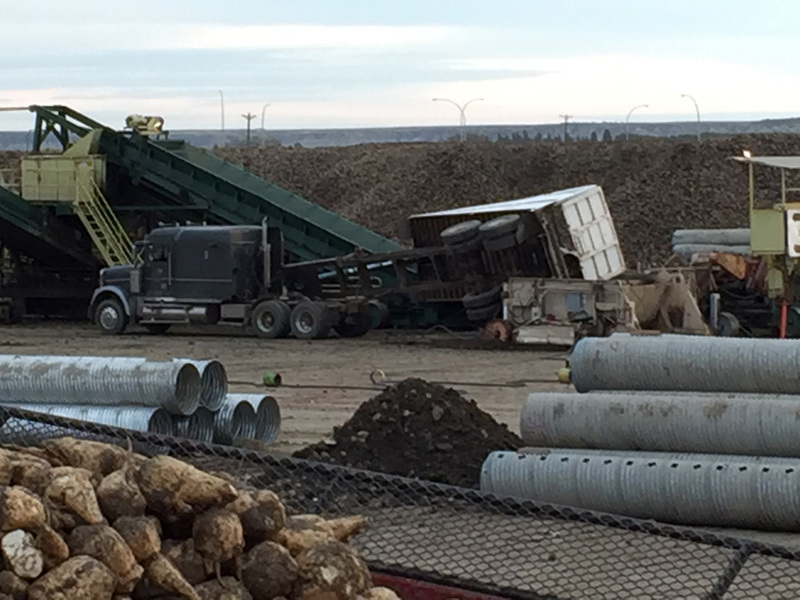 A dump truck flipped over on it’s side and crushed the conveyor belt, spilling beets everywhere. 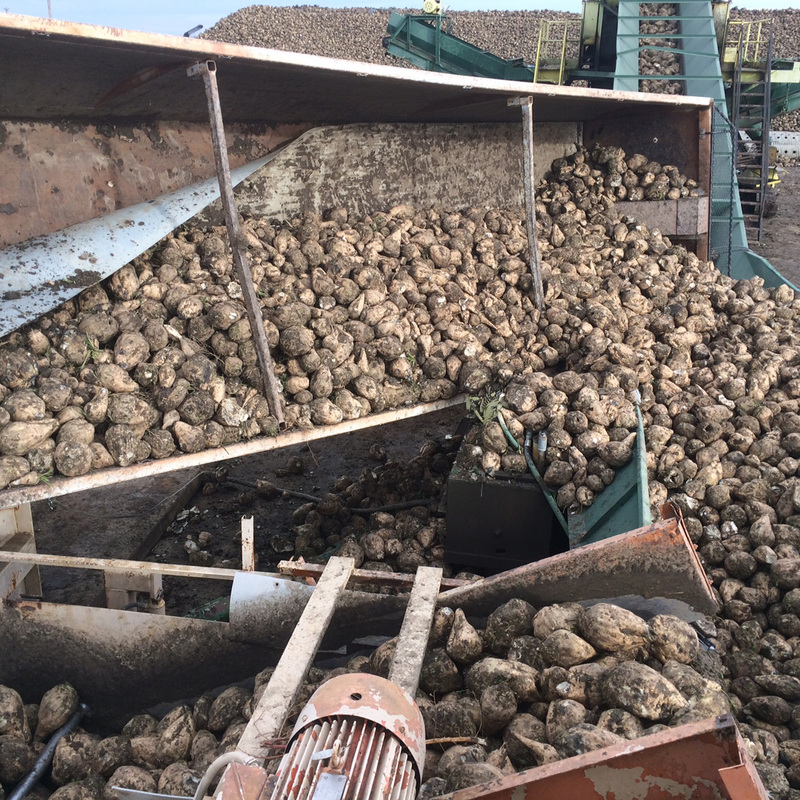 Thankfully no one was seriously hurt (one woman was hit by a flying beet), but it was both a major distraction and significantly added to our workload as that piler was shut down all day. Let me say this does happen. It is not common, but definitely something we heard about in our orientations. We were told very seriously to never walk between a truck and the piler when they are unloading. I will be honest though, in the past I broke that rule on occasion in my hurry to clean up beets, but never, ever again. On the plus side I saw was the team that was on the piler was immediately taken into a safety meeting and debriefed. That is exactly what is supposed to happen and since I coincidentally was getting coffee on my break and was in the same location as them, I can say it was handled very well. The team was encouraged to discuss what happened and the tone of the bosses was very very good. They were just gathering information and not laying blame of any kind, which again is a good thing. 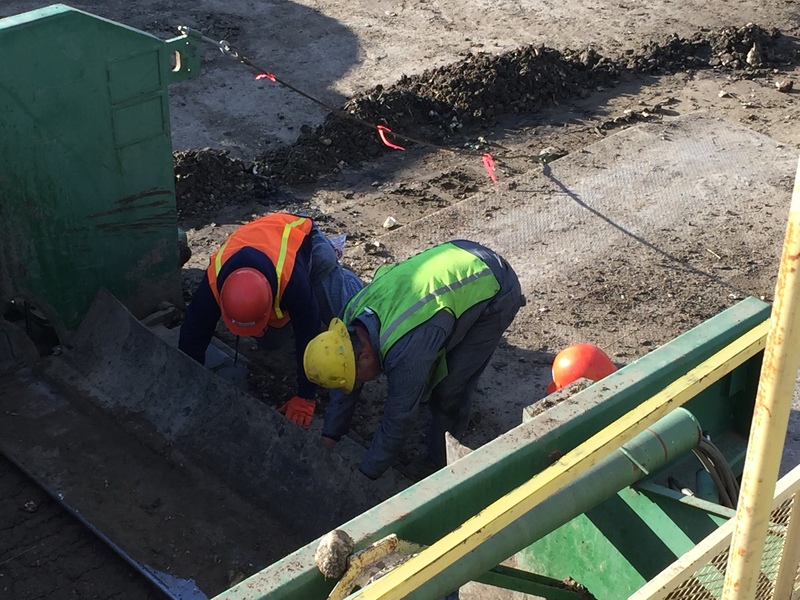 And although they did not call a meeting with the larger group, Bill, my favorite foreman, came up to me personally, made sure I had seen the accident, and reinforced the importance of not getting near the trucks when they were dumping. They take it very seriously and now so do I. Here are the pictures. I think they speak for themselves. This was one of the “fifth wheel style trailers” that is very long and has a arm that pushes it up. It is the least common type of trailer, but we do see several of these on our piler every day. So the piler was shut down all day because they had to have a crane come and lift the trailer off the piler. No clue if it will be fixed tomorrow, but it’s doubtful. As I said that put a lot of extra pressure on us and to complicate things our piler was down 3 times today for at least 1/2 hour or more. 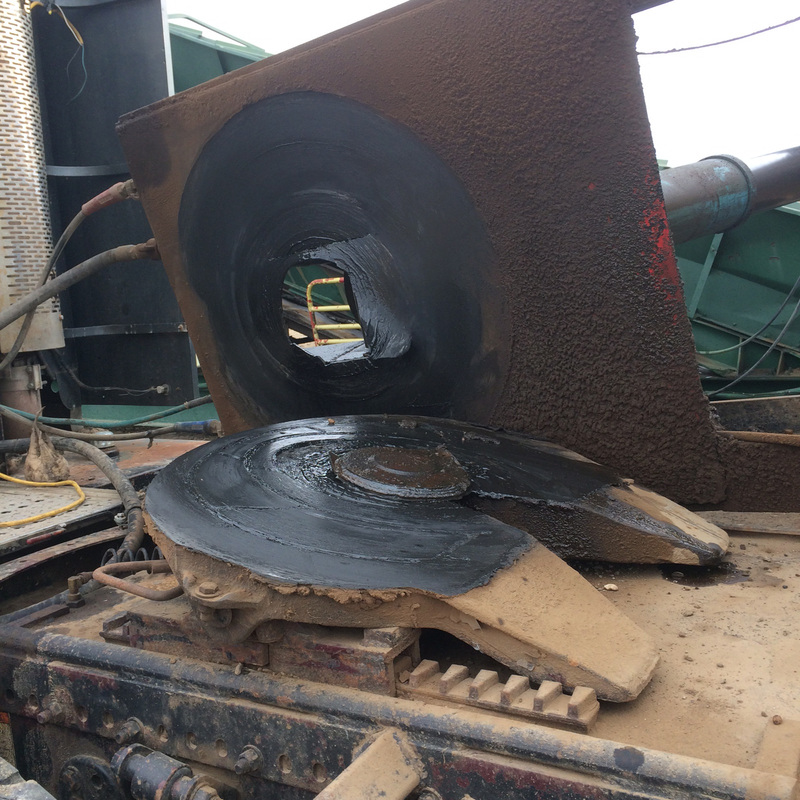 We had muddy screens, and bolts needed tightening, and once it was down over an hour. The line of trucks was backed all the way to the road for the first time since we have been working here and it’s not a great feeling. I will say though that because the results of the accident were staring us all in the face everyone was super careful, truck drivers, us, supervisors, everyone. And everyone was very understanding of the delays.We still processed 172 trucks, but we left a line for the second shift that was pretty long. 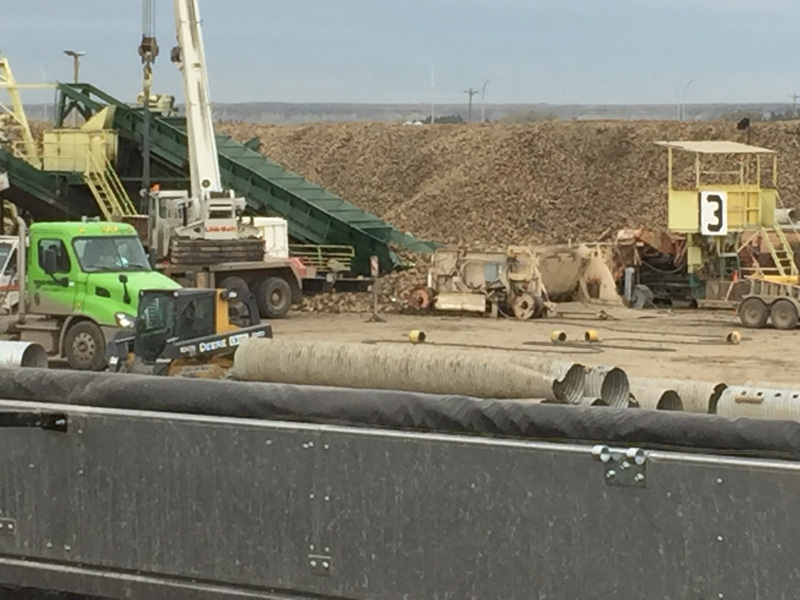 After it was cleared (about 3pm) the crew had to hand clear most of the beets around the conveyor. That would have sucked. I woke up after a very restless night, with some anxiety. Seeing the pictures again and writing about it really brought home the seriousness of what happened yesterday. The weather was good, but the wind did kick up near the end of the day and we got our first dust. They issued us dust masks in orientation, but it’s been so muddy it’s been a non issue. Not today. The trucks were kicking up dust and I understand why they said they would have water trucks watering the ground at one point. I’m pretty tired so I am just going to mention a few catch up things. Finally, I wanted to talk about Bill for a minute. He is my absolute favorite foreman, not just because he is very competent and attentive, but because he is the kind of guy who will stop and help pick up beets if he is walking by. Lots of people wouldn’t do that, and he certainly didn’t have to, but he had just finished some maintenance on our piler the other day right when I got a spill and he immediately stopped to help me. Bill is a really good guy. 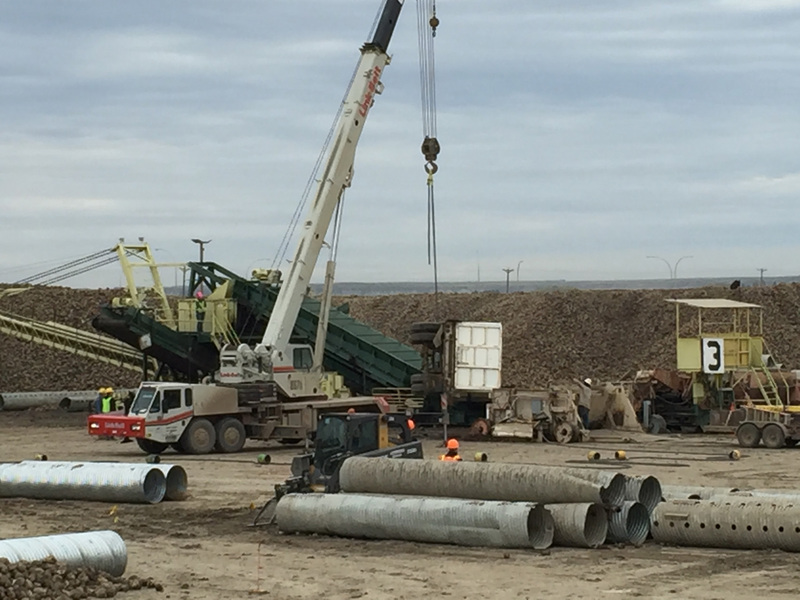 Thanks for the photos, “BE SAFE” No beet worth a injury/death. God be with you all. Another great post it is great that you take so much time to let us all know how things are going 🙂 Good to hear that you’re both doing well for the most part. What is really special about your posts is how you share it all…the good, the bad and the scary!!! So glad no one was seriously hurt. I also smile…you two have really taken possession of your jobs and may the best beeters win:o))) Once you have a work ethic…you always have a work ethic!!! 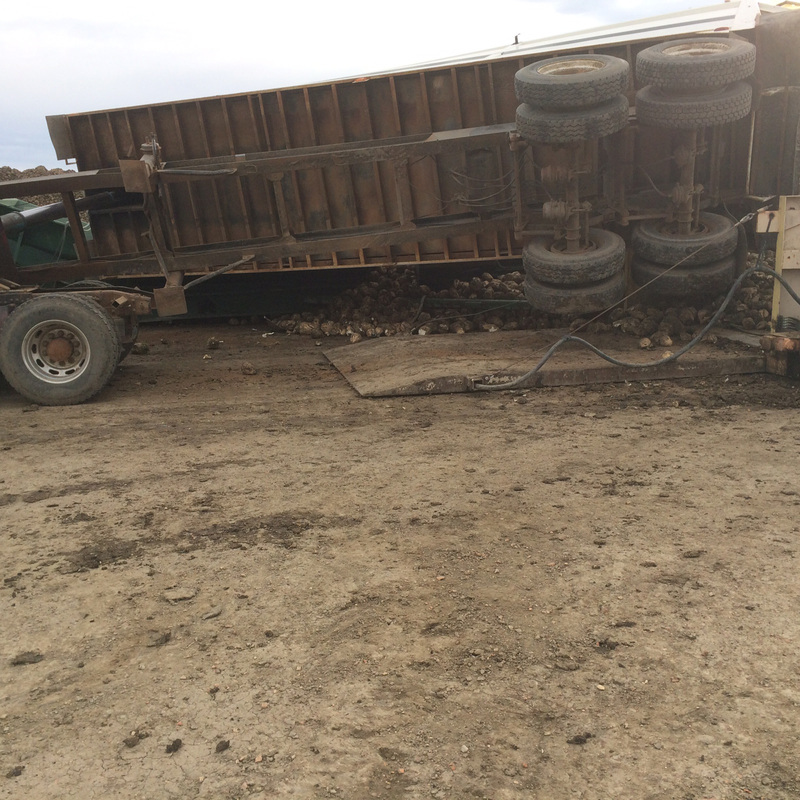 So glad to know no one was seriously hurt (although the lady that hit by the beet may not feel that way today) when the truck tipped over and seeing pictures of it was amazing. Thank God, literally, no one was under that pile! Thank you, also, for sharing; gives new perspective on what must be a very tiring and demanding, dirty job (step in anytime, Mike Rowe). I love Lee’s attitude! And I have no doubt it IS true – ya’ll are the best; both in work ethics, as others have said, but also in the way your team watches out and cares for each other. A good cohesive team that LIKES each other cannot be beat! Now for a team name…. I know I thought about team names at first but it seems a little hokey. We are the smiles crew though that for sure. Word of the day: hootenanny! We too were looking forward to that 70 degree weather but it did not show up, in fact it did not even come close! What’s the deal with that? You are 1/2 way through, hoping for good weather for you!